Illuminating the world through music is a familiar aspect of the Christmas season. As a child I could barely contain the excitement and anticipation that came with carol singing: early morning choir practices at school, preparations for the Sunday School Pageant, and playing favourite Christmas records on the HiFi at home all conspired to impress joyfulness on my childish heart. A notable favourite was a recording of French carols and what I could not understand linguistically was communicated to me through the irrepressible exuberance of the melodies and voices. These dance-like themes are wonderfully displayed in this year's Christmas Eve Mass setting by Marc-Antoine Charpentier (1643-1704). As a young man, Charpentier left Paris to study music in Rome and returned three years later, inspired by the relatively new forms of opera and oratorio and able to synthesize the Italian and French styles effortlessly. He was highly competent in all the musical genres of the day, but was destined to struggle for recognition at the court of Louis XIV and in the popular theatre due to the monopoly held by the more famous and powerful Jean-Baptiste Lully. After the death of his patroness, Mlle de Guise, he dedicated his attention to sacred music -- for which he is still best remembered -- at a time when most serious composers had stopped composing new masses. His method was to approach the Mass in the musical language of the secular and vernacular motet, and this ability to combine popular and liturgical forms was timely and effective. 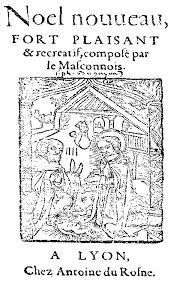 The Messe de Minuit pour Noël was composed circa 1690 for the Jesuit Church of St. Louis in Paris where he was mâitre de musique. It is entirely based on a group of traditional French noëls (carols) cleverly arranged together with some newly-composed material and crafted into the text of the Mass. The focus on the Christ-child is enhanced by the address to the newborn Jesus throughout the setting; the contrasting of upper and lower voices along with the additional voices of the orchestra (flutes, strings and organ) also contribute to the liturgical structure. The integration of various carols into a sacred context was common in the day. But then individual carols might be sung separately, or else used as a springboard for ornamentation and parody. In a display of originality, Charpentier based the entire Mass on these beloved melodies while maintaining their integrity and developing the connective harmonizations out of the carols themselves. With their themes of simple country life and child-like trust and joy incorporated into the liturgy of a deeply spiritual feast day, the noëls were made new again. Although very little of his music was published in his lifetime, it has since seen a significant revival in the late twentieth century -- a renewal. He remains accessible to modern musicians and audiences alike and is currently the most recorded French composer of the Baroque period. Charpentier's work is being performed this year at St. James' Midnight Mass of Christmas.